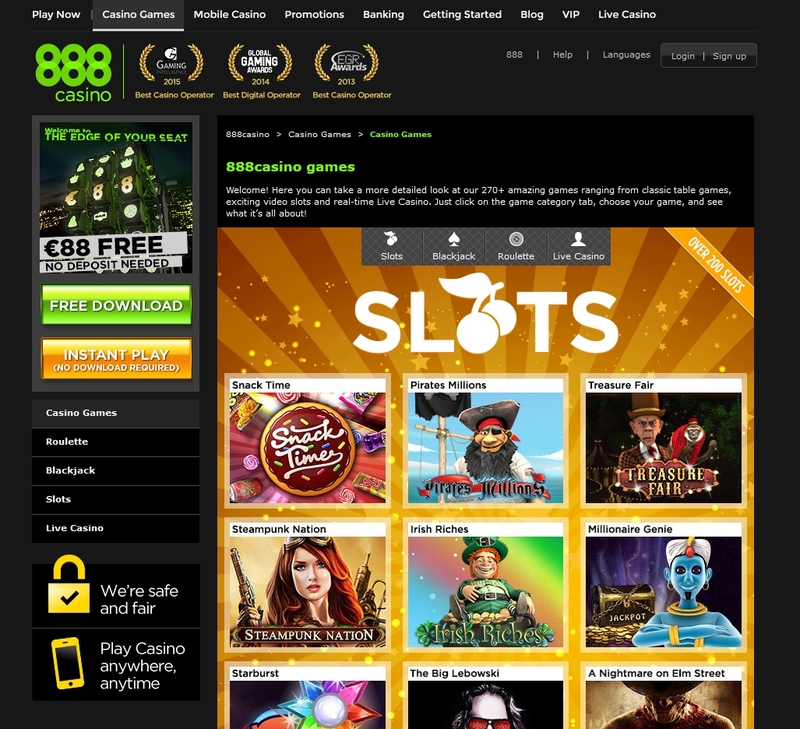 888 Casino first opened its doors for business in 1997 and has never looked back, growing into one of the most popular and well-patronised gaming sites. Licensed in Gibraltar and eCogra certified, this much respected casino has won multiple Casino of the Year awards, among many others the TotalGaming Award for Best Online Casino of the Year in 2012 and the eGR Award for Best Online Casino of the Year in 2013. 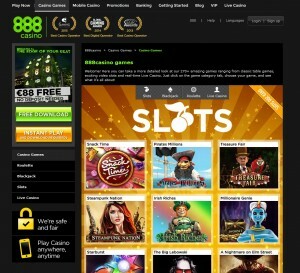 More than 25 million players worldwide have played at 888 Casino, making it one of the largest casinos on the Internet. 888 is also the only online casino to have platforms in all three US states (Nevada, Delaware, and New Jersey). However, only players residing in New Jersey are permitted to be real money players. 888 Casino uses its own proprietary software, which it is continually updating, giving players not only the benefit this online casino’s years of experience in the business, but also the superior graphics, sound, and animations that come from using the latest cutting-edge technology. Downloading is quick and easy, or if you prefer, you can select the non-download instant play flash version with a slightly more limited game selection. 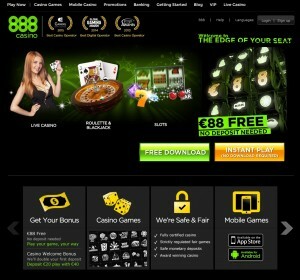 You can also play some of the 888 online gambling games on their mobile app. With 150+ games to choose from across the whole suite of online games, 888’s offerings can’t compete with the huge online casinos that can have up to 500 games, but all of the most popular games are represented, and there is still more than enough variety in both slots and table games to suit anyone’s taste and bankroll. Also, because 888 Casino has its own platform, it owns exclusive rights to all of the slot games, including the progressive slots with million dollar plus jackpots. All games can be played for free, excluding progressive jackpot titles. This is really useful if you want to learn a new game, or sharpen up your skills if you haven’t played for a while, without having to place any real money wagers. The casino accepts the following currencies: US dollars, Canadian dollars, Euros, British pounds sterling, Swedish kronor and Danish kronor. Players can also choose from 17 different language options. 888 Casino, like practically every other major online casino, welcomes new players with an attractive bonus as soon as you sign up and make your first deposit. The standard Welcome Bonus for 888 players consists of a 100% match of your first deposit up to 140 €/£/$. While this amount may seem small compared to the enormous bonuses promoted by some online casinos, more often than not, the promise of huge bonuses come with large deposits and onerous wagering requirements. At 888, the required playthrough is a very reasonable 30x the bonus, after which you can keep not only what is left of your own deposited money and any winnings, but what is left of the bonus, too. 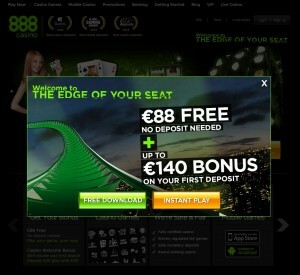 At 888 Casino players can sample games from over 10 different game developers. While other online casino sites are powered by software from one company, like Microgaming or Playtech, 888 Casino has cherry picked their favorite games from a host of different designers. This creates a rare opportunity for players to sample a much wider slot machine selection, all in one place. While the number of games is limited, with only about 50 to choose from, there are is still plenty of variety across the selection, from the familiar land-based Vegas-style slots to the latest 3-D slots with unique themes and wildly imaginative graphics. 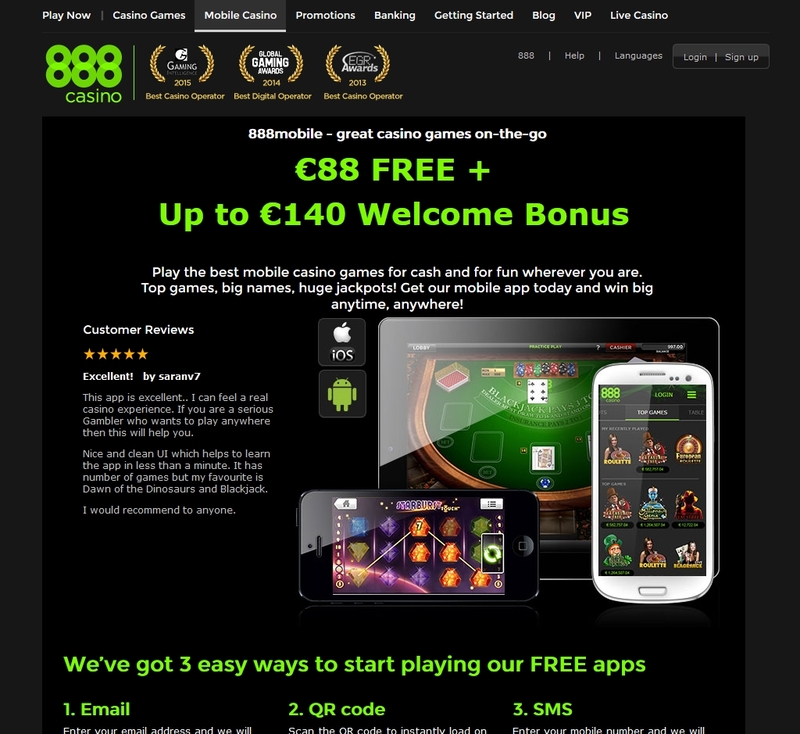 888 Casino also offers a quality mobile casino that, while light on games, does boast a high quality of game play compared to competitors. The mobile app works on both iOS and Android devices. 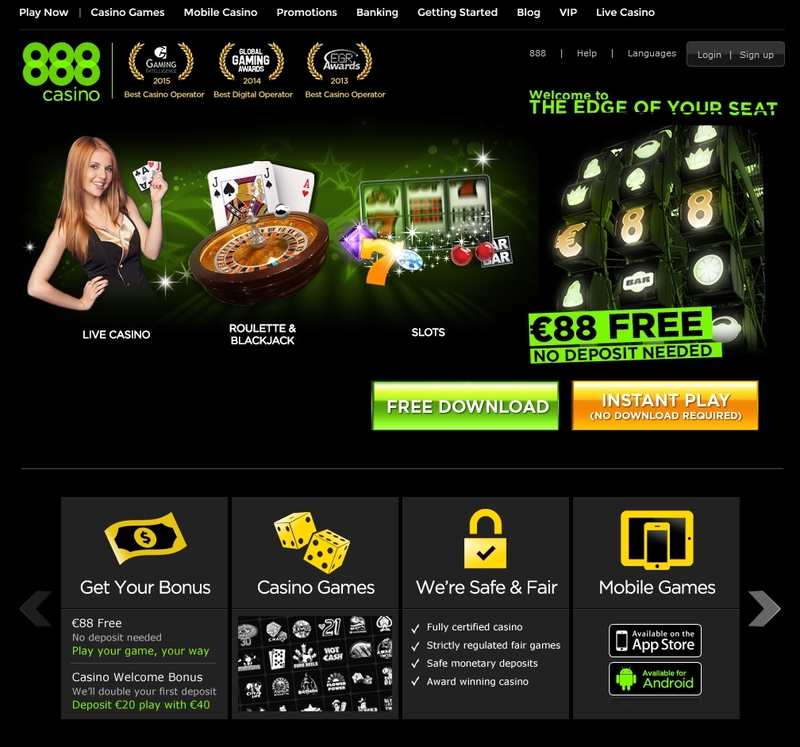 The most common method for downloading the app is to go to the 888 Casino website from the smartphone or tablet and follow the instructions provided. Players can also scan the QR code from their computer screens, available on the site. 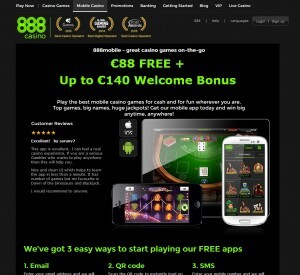 As a way to encourage use of their mobile app, 888 offers additional welcome bonuses for deposits made at 888 mobile, although players can also use the same account they use for online gaming. 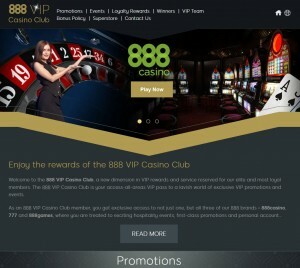 888 Casino offers a host of regular promotions to keep players coming back. Players can earn up to 500 €/£/$ per week in FreePlay cash through various bonuses and cash back offers, including raffles and rewards for playing specific games on certain days. 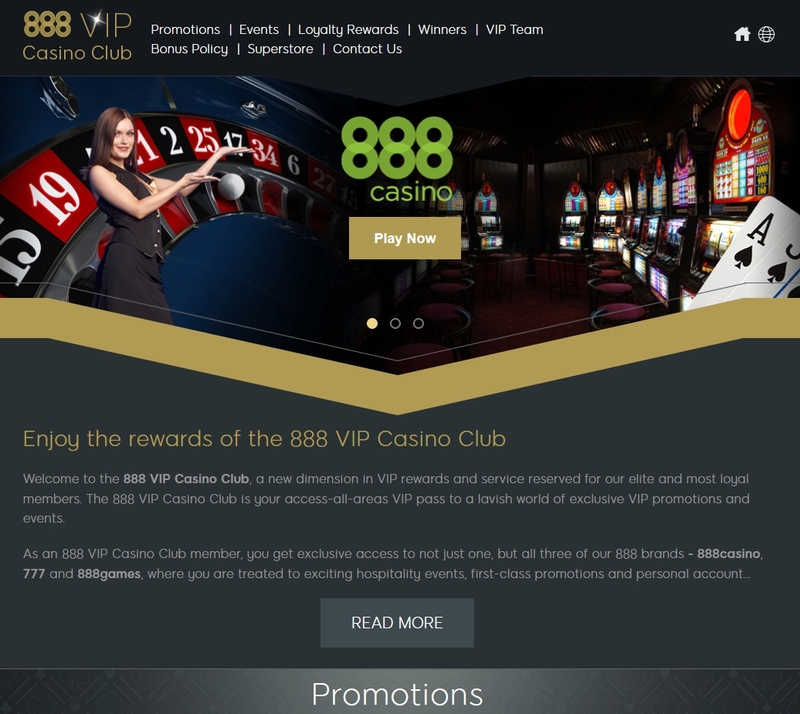 Besides the promotions mentioned above, 888 also has a VIP program and 888 Private Room for high rollers, with all kinds of rewards and benefits. Registered players can also receive a 100 €/£/$ for referring a friend to 888. 888 Casino offers comprehensive information on their website about all aspects of registration, deposits and withdrawals, including expected time frames for withdrawals. They offer an email connection for players to request help or advice with any queries, but no telephone or live chat options. 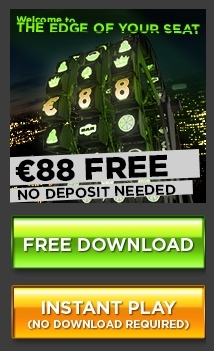 888 casino makes banking a snap, offering numerous options for deposits and withdrawals, including Bank Draft, Bank Wire Transfer, ClickandBuy, MasterCard, Neteller, PayPal, Paysafe Card, Ukash, Visa Electron, PayPoint e-Voucher, Visa, Przelewy24, iDEAL, Sofortuberwaisung, POLi, Abaqoos, Boleto, Swedbank, eKonto, SEB Bank, Moneta, Diners Club International and Skrill. Withdrawal methods are more limited and can be made via Bank Wire Transfer, Cheque, ClickandBuy, Laser, MasterCard, Neteller, PayPal, Visa Electron, Visa, Entropay, Moneta.ru are Skrill. Some withdrawal methods take a lot longer to be processed than others, so check the website for information on expected time frames. 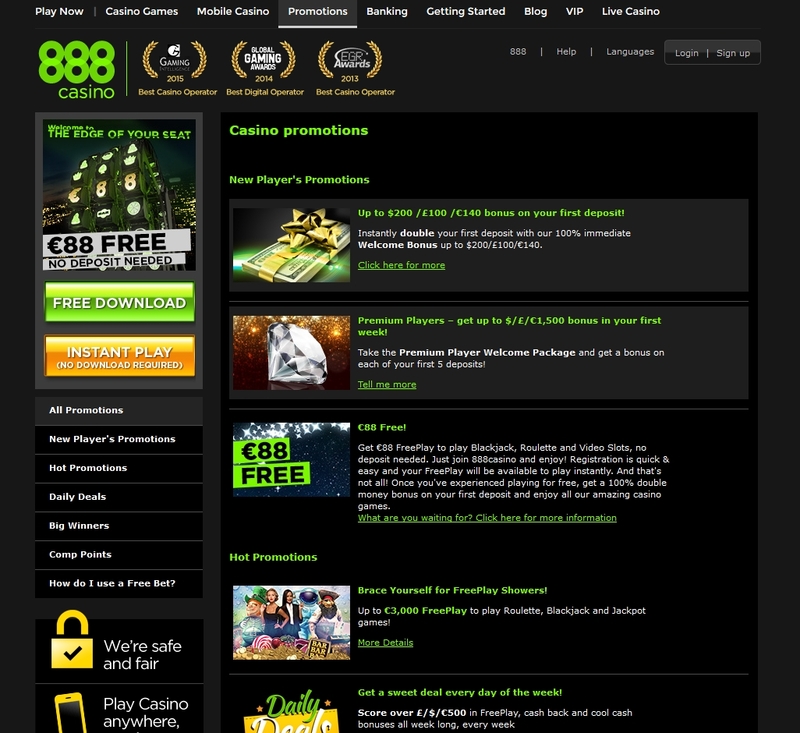 As one of the longest-running and well-established casinos, with numerous awards for excellence to its name, players can be assured of a gaming experience at 888 Casino that is smoothly run, highly professional and with all the necessary industry-standard checks and balances for safety, security and fairness in place. 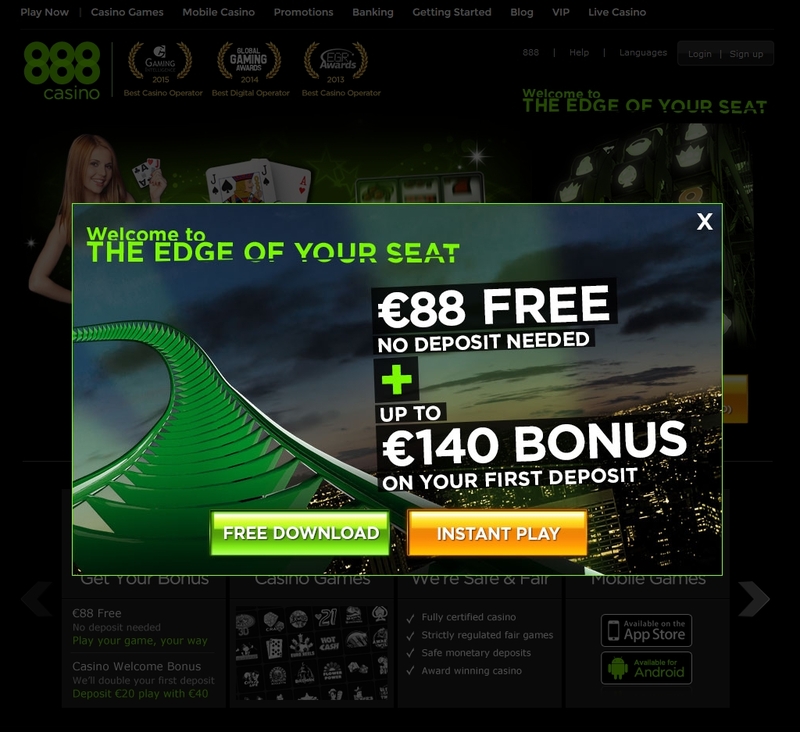 While the games on offer are relatively limited in scope, 888 Casino, with its own operating platform, fields a number of unique games not available elsewhere.